Daniel joined Watsi on March 8th, 2015. Four years ago, Daniel became the 1003rd member to automatically support a new Watsi patient every month. Since then, 4,084 more people have become monthly donors! 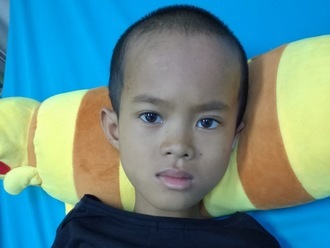 Daniel's most recent donation traveled 8,800 miles to support Vanly, a boy from Cambodia, to fund spinal surgery. Daniel has funded healthcare for 79 patients in 12 countries. Lemi is a baby from Ethiopia. He is the third child in his family. He loves to play and laugh with people. Lemi was born with an abnormal bowel condition. He underwent a surgery that offered a temporary solution, but he needs to undergo another surgery to fully repair the condition. This procedure is scheduled for January 15 and will cost $1,500. His mother says, "We are financially struggling to pay for medication and to provide him treatment." Let's help Lemi's family raise money for surgery! Allan is a child from Kenya. He has one sister. His father earns a living selling flowers. In early December, Allan fell off of his bicycle. He sustained a closed fracture of the radius and ulna of his left hand. He is currently in pain. Fortunately, surgeons at our medical partner can help. On December 11, Allan will undergo a fracture repair procedure, called an open reduction and internal fixation. Now, our medical partner, African Mission Healthcare Foundation, is requesting $998 to fund this procedure. “Kindly assist him to get treatment,” Allan’s father says. Yasin is a baby from Tanzania. He is an only child to his young parents. Yasin was diagnosed with bilateral genu varus. His legs are bowed outward. This condition is typically caused by an excessive accumulation of fluoride in the bones, which often stems from contaminated drinking water. As a result, he has difficulty walking. Our medical partner, African Mission Healthcare, is requesting $940 to fund corrective surgery for Yasin. The procedure is scheduled to take place on September 6. Treatment will hopefully restore Yasin's mobility, allow him to participate in a variety of activities, and greatly decrease his risk of future complications. Yasin’s mother says, “Thank you very much you have brought hope to us." Tha Shee is a 35-year-old woman who lives with her husband, four daughters, son, and grandchild in Mae La Refugee Camp, Tak Province, Thailand. Nine years ago, Tha Shee started to feel tired when she walked and worked. After two years, her condition got worse, and she decided to visit the hospital in the camp. There, a medic gave her medication that did not improve her condition. Finally, she went back to the same hospital, and an ultrasound test revealed that she has a heart problem and that she needs surgery. They referred her to our medical partner, Burma Children Medical Fund (BCMF). Now, Tha Shee is scheduled for surgery on August 8 to repair her heart condition called atrial septal defect closure. She needs help raising $1,500. She says, "I am not able to work nor to do any household chores because of my condition. My family suffers from a lower monthly income, and my children have to take over the household chores. I hope to get better soon and work hard after my treatment to save up money." Vannarapich is a two-year-old boy from Cambodia. He has one brother and two sisters. He likes to play with toys at home. Four months ago, Vannarapich was burned by boiling water, burning his left elbow. Burn scar contractures have developed, tightening the skin around his burn. It is difficult for him to bend his elbow. When Vannarapich's family learned about our medical partner, Children's Surgical Centre, he traveled for one and a half hour seeking treatment. On July 9, surgeons at CSC will perform a burn contracture release surgery to to release his elbow stiffness. Now, his family needs help to fund this $448 procedure. His mother says, "I hope my son's elbow regains mobility and he can move it again after the surgery." Sok Ma is a mother of two. She has one son and one daughter. She likes to spend time with family and cook. 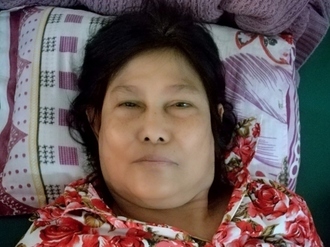 On April 20, Sok Ma fell on the ground and dislocated her right elbow. Ever since, she has had pain in her right elbow and cannot easily use her arm. She needs to undergo an open reduction procedure to fix the recurrent dislocation in her elbow. Surgery is scheduled for June 4. Now, she needs help funding this $390 procedure. She says, "After the surgery, I hope to have a normal elbow without pain, and be able to return to work."